No politician in Westminster has divided public opinion more than Peter Hain and no constituency in Wales has demonstrated the futility of mindless tribal voting than Neath and Port Talbot. They obviously didn't understand or maybe didn't care that they were being taken for granted and used. Peter Hain was twice rejected by the discerning voters of Putney where he failed to unseat David Mellor, a shallow Tory buffoon and philanderer. Neath had a fine tradition of selecting a local people as their parliamentary representative such as Sir William Jenkins, David Williams together with Donald Coleman from nearby Barry. It will remain a mystery why the noble people of Neath allowed themselves to be patronised by the champagne socialist London elite who control the Labour Party. The undiscerning voters of Neath swallowed the carefully constructed public image of Peter Hain lock, stock and heating oil allowance. The supposedly fearless warrior against apartheid was harassed and forced from his native land to carry on the fight in Great Britain. Unlike their Welsh counterparts the discerning voters of Putney obviously had the ability to look at the facts, ignore the image makers and form their own opinion. The story goes that Hain ran messages for the African National Congress and at the age of 10 his bedroom was searched by the South African police looking for incriminating evidence. At age 15 he spoke at the funeral of a terrorist hanged for murdering a 77 year old woman and mutilating 23 innocent civilians when he placed a bomb at a railway station. His parents were banned for putting up anti-apartheid posters so they decided to abandon the cause and their people and head for the safety Britain. Its worth noting that anyone opposing apartheid in South Africa at that time were harassed and banned by the government, this treatment was not exclusive to the Hain family. At great personal risk most of his anti-apartheid comrades chose to stay and carry on the fight. Unlike his future constituents Peter Hain went on to have an elitist education then joined the Liberals and became a Trade Union researcher. His 'fearless' fight against apartheid consisted of the 'Stop the Tour' campaigns against the South African rugby and cricket matches. At great personal risk our hero was involved with digging up cricket wickets and scattering nails on rugby pitches before milking the publicity for all its worth. This direct action associated with the anti-apartheid campaign proved to be good material for the image makers in the years that followed. In the meantime back in his native South Africa his comrades were being harassed, imprisoned, tortured and killed. Hain's political ambitions proved stronger than his principles. With no chance of a political career as a Liberal, he suddenly discovered socialism, dumped them and joined the Labour party. The only thing that was required was a brain dead electorate who could be guaranteed to co-operate and it wasn't the discerning voters Putney. Peter Hain went on to have a controversial parliamentary and ministerial career, notorious for its scandals and resignation. Joining his new rich friends he adopted socialist principles, such as having no respect for taxpayers or their hard earned money. Outrageous expense claims such as heating oil, a roof for his woodshed, asking the taxpayers of Neath to pick up he bill for servicing his Aga and cleaning his windows. And then there was the faux leather tray, the posters and calenders, pens and ink. He even put his 80 year old mother on the payroll. High on the list of scandals was the contributions to his leadership campaign. These were funnelled through a non working, recently created 'think tank' and not declared to the commissioner. His excuse was accepted by the commissioner but its still unclear what the 'think tank' was for. He stabbed the people of Gibraltar in the back over sovereignty and is not welcome on the Rock. The same was in store for Northern Ireland over his agreement with Sinn Fein on a united Ireland. It's been stated before that with the British economy in ruins and her institutions destroyed, Hain retired to the backbenches to finish his term in comfort and to await his sinecure in the House of Lords or the European Union. One thing is for sure, unlike other anti apartheid exiles, he will not be returning the his homeland to live out his days in the peace and security of the 'Rainbow Nation'. 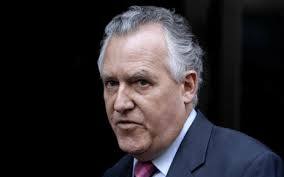 In conclusion, is Peter Hain the heroic fighter against apartheid, forced out of his native land to carry on the fight in exile, who then discovered socialism and selflessly stood up for the poor, the downtrodden and the disadvantaged.......or is he an impostor, a narcissistic, ambitious, political opportunist and backstabber who is prepared to go to any lengths for personal advancement? Hain, you've brought enough shame on the people of Neath and Port Talbot with your cowardice and self serving, backstabbing antics. Do your constituents a favour and crawl back under your rock until you join the other freeloaders in the Lords or the European Union. Update: As predicted the champagne socialist hypocrite was indeed elevated to the House of Lords and now labours under the grandiose title of Baron Hain of Neath in the County of West Glamorgan. For many people, disillusionment with the left and Trade Unionism became a final break in the aftermath of the Great Miners Strike of 1984. It became abundantly clear that the leadership of the National Union of Mineworkers (NUM) abused the traditional loyalty of their membership and the coal mining communities in order to pursue a political agenda. These communities were left devastated, the consequences of which endure to this day. It is now cast into legend that a cruel, heartless Mrs Thatcher was to blame but this does not stand up to scrutiny. Even a tertiary examination of the facts prove this to be a cynical manipulation of history which has become a hallmark of the left. Trade Unions started with humble beginnings and by honourable people. In the absence of a welfare state and national health care provision, Friendly Societies were formed as mutual support systems for those in the community who had fallen upon hard times or were taken ill so as they could not support themselves or their families. These Societies eventually became trade specific and began challenging employers on terms and conditions for their particular trade or industry. Although Unions were technically legal, employers and their supporters, remained hostile to the idea of collective action for mutual benefit. 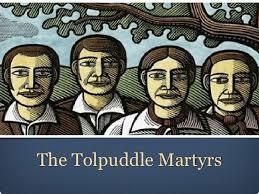 When six humble agricultural workers from Tolpuddle in rural Dorset risked everything to form a Society, in effect a Trade Union, and refused to work when their wages were lowered, they were prosecuted. They were found guilty using an obscure law which forbade the mutual swearing of oaths and subsequently transported to the penal colony in Australia. The severity of the punishment provoked outrage. Hundreds of protests and marches across the entire country eventually secured their release. As a consequence of their acquittal and release, their collective action had effectively been condoned and with this Trade Unionism was born. Collective action empowered groups of workers and this gave them some influence concerning the terms and conditions in the industries in which they were employed. It is the scope of this influence that plagues British industry to this day. Wherever there is a source of power there will be unscrupulous opportunist who will attempt to usurp that power for their own corrupt ends. As soon as collective action was seen to be an effective tool for gaining concessions, ideologically inspired individuals did indeed usurp that power then broadened its scope from agreeing local terms and conditions to taking over the running of the entire industries. Trade Union barons became so powerful that they could challenge democratically elected governments, as was witnessed during the Industrial strife in Great Britain in the 1970's and 80's. These ideologically driven Union barons could no better run a country than they could run their individual industries and with the assistance of their puppet politicians in Parliament disaster for British industry followed. Beer and sandwiches with Prime Minister Harold Wilson and his government gave rise to the Closed Shop legislation, demarcation lines, picket lines, secondary picketing, flying pickets, sympathy strikes, wild cat strikes, the three day week, power cuts, rubbish mountains and the unburied dead. For those with an unjaundiced view of history, this era of unbridled union power signalled the end of Great Britain as a global industrial power. The Great Miners Strike of 1984 was an attempt by politically inspired Union barons, Arthur Scargill and Mick McGahey, together with their useful idiot minions in the NUM, to abuse the loyalty of the coal mining communities and bring down the democratically elected government of the day, a government with which they disagreed ideologically and despised. They knew the consequences if they failed but as always with their perverted creed, the ends will always justify the means and they got to walk away unscathed and unpunished. I observed the wreckage of the communities at the time and I still see the continuing aftermath today and in spite of this, for the barons nothing has changed. They were and still are ideologically inspired cowards and they still abuse their members loyalty to engineer the imposition of a socialist state. One noticeable difference is that in some cases the workers are almost as unprincipled as their bosses. Their loyalty can be bought with money extorted from employers too weak and cowardly to stand up to the unprincipled use of industrial muscle and blackmail. The abuse of working people and the long suffering public by ideologically inspired, fat cat union barons, who are immune from the misery they cause or to the financial consequences of their actions, is a great betrayal of the sacrifice made by the principled and honourable workers of Tolpuddle who must be turning in their graves.